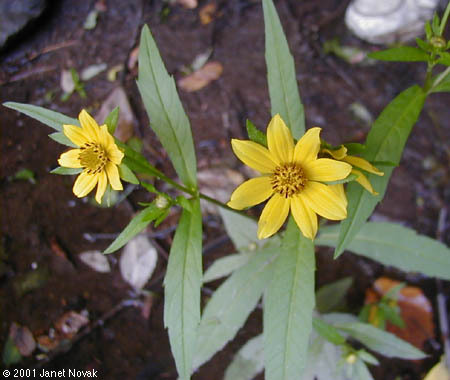 Bidens laevis. ©2001 Janet Novak.ct-botanical-society.org. (Accessed5/2014). Bidens laevis is an annual herb to perennial, 25-100 cm tall, much like B. cernua, not nodding as much. Leaves opposite, simple, long and narrow (lance-shaped), 4-20 cm long, 0.5-4.5 cm wide, stalkless, margins toothed sometimes lobed; sometimes nodding in fruit. Flowers yellow, ray flowers about 8, 1.5-3 cm long, disk 1.5-2.8 cm wide, papery bracts among red-tipped disk flowers, basal bracts hardly leafy; flower heads erect; blooms and fruits Aug.Oct. Fruit 1-seeded (achenes), 3-4 angled, with 2-4 barbed awns. Habitat: Marshes, stream margins. Tolerant of brackish water.